I know, I know, … it's a shame to cut apart a beautiful frame, but if you're afraid to cut a car up, you're not a true street rodder right? I'm pretty sure you can order a TCI frame already notched, but I like to modify some things myself. 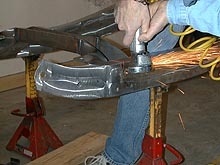 We're going to notch the front rails ¾” for extra spring clearance. The spring of choice is a Durant “One and only” Mono spring. 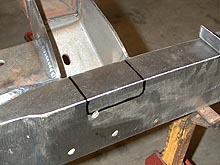 Jim Durant makes several versions depending on axle width and desired ride height. This is the lowest ride height available. I'll talk more about this spring when we install it. It's the only way to go! 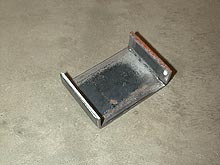 Here's a little piece of 10 gauge steel 2” wide with a 2 ½ x ¾ bend to place in the frame. The recipe calls for 2 of these. We set the spring in its place (chassis upside down) and picked the spot to place them. The shape was then drawn on each rail. You can see it will go right through one of the boltholes on the frame, but we aren't using these holes anyway. 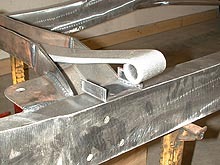 A cut-off tool was then used to cut the horizontal cuts. It's the new Windows33! Let me tell you, it looks good in there. 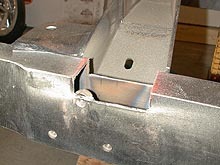 You can see the precision and superb penetration of TCI's welds. Yogi was right, this is an awsome frame. 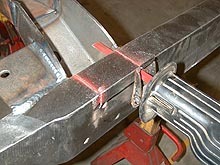 See the welded in nut? We ground this down to make room for the plate.